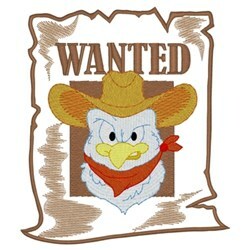 This wanted poster with an outlaw cowboy chicken design is super cute! Stitch this onto a child's tee or bib! Dakota Collectibles is happy to present Wanted Poster machine embroidery design which has 12716 stitches and is [99.57 mm x 87.63 mm] large. If you would like to view more embroidery patterns please search on our embroidery designs page.